Pandigital, best known for making digital photo frames, announced today an Android-powered e-book reader called Novel, a slick device with a 7-inch touchscreen LCD (sorry, no multitouch). Let's first check out the specs: the Novel has a 7-inch color 800-by-600 LCD. It lacks 3G and a camera, but the Novel has an ARM 11 processor, Wi-Fi, and 1GB of internal memory (a 2GB model will be available in June) as well as slot for SD/MMC cards. The battery life is purportedly good for around six hours, or about one flight across the US. On top of an Android operating system (this means lots of apps! ), you'll be able to download over a million e-books from Barnes and Noble's eBookstore, as well as watch video and show off photos. Novel supports PDF, ePUB, as well as HTML. Let's talk about price: the Novel will set you back $199, while Amazon's Kindle costs $259 and Apple's iPad starts at $499. Pandigital already has a huge network of retailers, so you'll be able to pick one up at stores like Kohl's, Macy's, Costco or even Bed, Bath & Beyond. What's next for the Novel? Pandigital reports that a Novel with access to AT&T's Edge network will be available later this year. Why AT&T Edge? That network "reaches 97% of the geography in the US," according to Kelly Odle at Pandigital, and their Photo Mail Digital Photo Frame already uses AT&T Edge to receive photos via email. A 6-inch e-ink Novel is also purportedly in the works. With features that'll appeal to a wide range of customers (including a low price), perhaps the Novel will provide some competition for the "magical" iPad. Excited for the Novel? 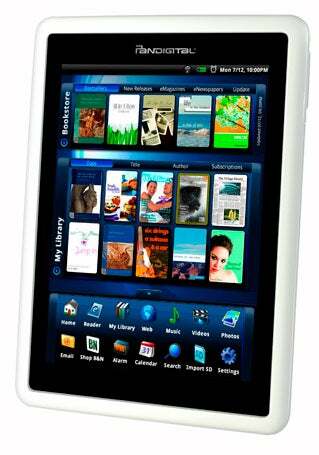 What would you use this e-book reader/tablet for? Sound off in the comments! Updated May 25, 2010 at 10:33 AM to clarify whether the Novel includes multitouch capabilities. It doesn't.